Look! 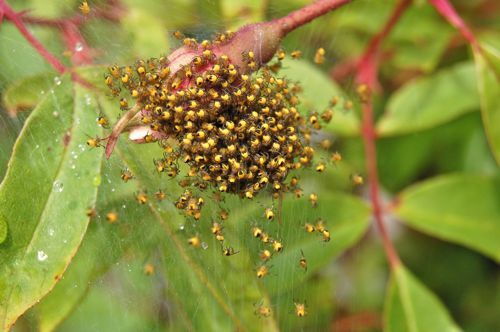 Tiny baby Golden Orbweavers just hatching in my garden. Aphids, beware! And I thought I’d take a crack at it today. If you’d like to play along, leave a link to your list in the comments. My list is below the fold! Aren’t they pretty? 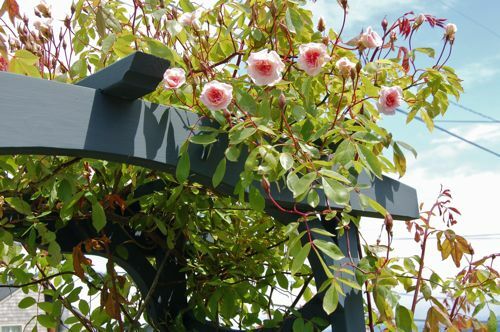 This photo was taken a few days ago and the flower count has tripled in that time. Swoon. I have that smelly photo prop by my bedside and our bedroom smells so beautiful. Which is saying something, because I’m so behind on laundry this week! Working on: sadly nothing too glamourous. In the past two weeks I’ve made several half-hearted attempts at the laundry. And today, if it kills me, I’m finishing it all. Washed, dried, folded, PUT AWAY! Wish me luck. Thinking about: how fortunate I am to have such wonderful friends. I discovered today, that the very talented Janell (who makes such gorgeous soaps!) just posted a sweet post about Mireio on her blog. I am so touched by all the support I get from friends regarding Mireio. It’s utterly awesome! I’ve always said that if you want to show a friend that you love them, love their KIDS. (or what’s important to them!) And Mireio really is an extension of me—so, when my friends support me in the ways that they do, well, I feel so loved! Anticipating: skirt weather. Last night came close, it wasn’t quite warm enough for a skirt, but it was balmy and IZ and I had dinner on the porch and breathed in all the flowers blooming. Also, because, as the post before this demonstrated, my legs could use some sunshine! Listening to: my sweet man, Handsome, fweep his head off. But at night, when we’re all hanging out in the living room, he warbles these adorable little songs and we all coo and talk sweet talk to him. IZ keeps saying, “Who knew a Parakeet could be such a sweet pet.” It’s true, he bring a lot of joy and we love listening to his “fweep fweeping”. Eating: I’m going to cheat on this one and say drinking instead of eating. Lately, I’ve been completely obsessed with Jasmine tea. 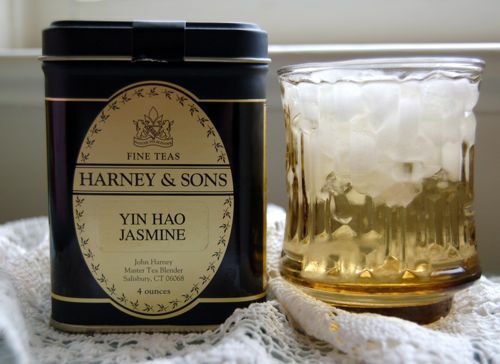 It’s totally Linda’s fault since she posted a photo of Teas’ Tea a few weeks back and I realized I had tin of loose Chinese Jasmine Tea from Harney’s. I’ve been drinking it over ice and I realized yesterday, that it reminds me of home. We can’t grow jasmine here due to the weather, and I miss that smell so much. Especially at this time of year. When we lived in Marin, IZ and I would take long walks in the evening and I was always stopping to bury my head in the star jasmine bushes along our path. I’m probably lucky I never snorted in a bee! So, the tea has me nostalgic and hydrated. Praying for: So, so many people. You know who you are!! Wishing: and hoping that you know how beautiful and talented and wonderful YOU are. And just how much I appreciate having you in my life. Now… go write your list! I can’t wait to read it! 4 Responses to Currently. . .
I’m sure working on it! I have one more bit to do in the front yard this year and then, it’s the I have to attack the jungle in the back-yard. Heaven help me! Love your post. And especially hearing about Handsome. After being pet-less the last two years (from a lifetime of pets), it makes me want to go out and get a Parakeet! Thank you. Handsome is such a lovely little guy. I’m amazed at how joyful he is. Parakeets are pretty easy to keep as long as you either 1. have time to spend with them, or 2. get them in pairs. They are flock birds and need a flock to be happy. We all are home each day, so he gets lots of love an attention. I really adore our little guy and I don’t think a day goes by that one of doesn’t say how happy we are that we got him.